Featuring design by deVOL Kitchens. 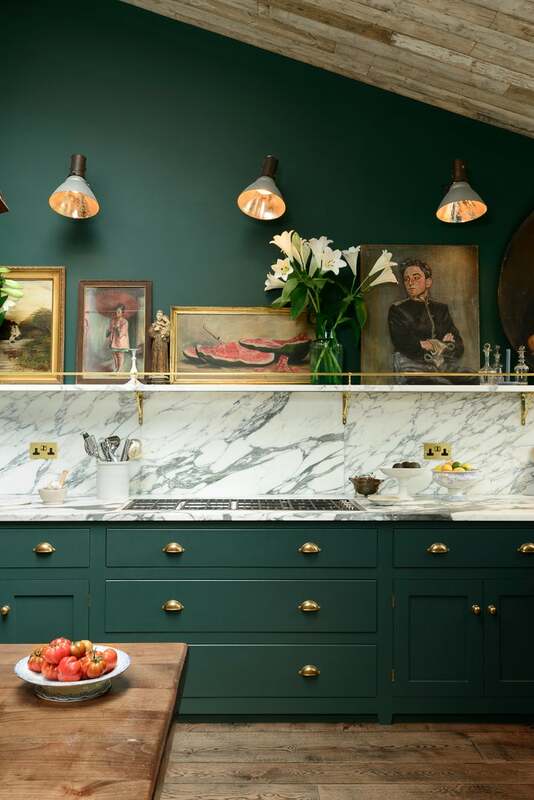 If you’ve surfed Pinterest or Instagram for kitchen design inspiration, chances are you’ve discovered a kitchen designed by deVOL Kitchens. The design house, based out of Cotes Mill, creates the dreamiest spaces. And lucky us, they’re opening a showroom in New York City—East Village, to be exact—in January. Yep, they’re expanding stateside! This past weekend they shared a few of their favorite kitchens with us—keep reading to learn more about their bespoke, handmade creations. They offer a wide variety of accessories, including ceramics. You can also find handles and knobs, seating and tables, handmade ceramic tiles, sinks and faucets, kitchenware ceramics, flooring, ranges, as well as antique finds. Essentially, deVOL can design your kitchen in full, top to bottom, courtesy of their wide selection of handmade products. The company specializes in four kitchen styles—The Real Shaker Kitchen, The Classic English Kitchen, The Sebastian Cox Kitchen by deVOL, and The Haberdasher’s Kitchen. Each has a distinct feel and can be designed to fit your needs—storage, space, aesthetic, backsplashes, and beyond. Every inch of each of their kitchens, this Classic English Kitchen located at their St. John’s Square showroom included, is well thought out and impeccably designed, down to every last detail. We’re impressed, and also simply love the pink and green color combination (here are some new color pairings we’re stealing from the French!). Deep green cabinet paired with a marble backsplash? Talk about a dream kitchen. We love how the open shelf can be used as an art ledge or for additional storage and that the walls match the bespoke painted cupboards. You can see more photos of this Peckham Rye kitchen on deVOL. How Does Your Kitchen Compare to a Celebrity Chef’s?